Image scanned by Gerald Ajam and captions by Tiaw Kay Siang and Sabrina Lim. This is a fairly accurate account of the illustrated scene, though the object in Becky's hand is better described as an ambiguous white protrusion. The assertion that it is a kind of poison can be supported by an observation Jos makes in Chapter LXIV. When Jos is appealing to Amelia to come and see Becky he mentions: "God bless my soul! Do you know that she tried to kill herself? She carries laudanum with her — I saw the bottle in her room" ( 658). In the absence of any other suggestion, it is fair to assume that the unknown object is a phial, possibly containing the laudanum Jos spoke of previously. It is also possible that this is a phial of medicine, which Becky has continued to administer to Jos since "She tended him through a series of unheard — of illnesses" (685). This is certainly plausible considering the fact that Jos is still in "a condition of pitiable infirmity" (685) and his "health is so delicate" (687). Whatever the object, Becky's crime is only truly confirmed by the reference to Clytemnestra in the illustration's title. Without it the image would not demonstrate Becky's guilt so definitely. The illustration itself only shows that Becky is hidden behind a curtain, holding an unknown object, whilst Jos is speaking with Dobbin. It is true that Becky's presence is only communicated by the illustration and not by the text; this extratextual information is unusual in Vanity Fair's larger illustrations. However the fact that Becky's presence goes unmentioned simply suggests that the fallible narrator does not know she is there. Though the image of Becky's eavesdropping does warrant heightened suspicion, it does not prove her guilt. Gilmour feels that "this is an unfortunate illustration, unnecessarily coarsening the character of Becky" (56). This is not entirely accurate. Michael Steig points to the interpretive importance of this caption, for the title — "Becky's second appearance in the character of Clytemnestra" — accuses Becky of murder, and not the image itself. Tellingly, Steig has also pointed at the reference to Clytemnestra before asserting that "Thackeray's intentions can hardly be doubted" (1). Both critics have felt it necessary to mention the caption before they can comfortably assert that the illustration accuses Becky. The text certainly does not provide any solid evidence against Becky, only the suspicions of others. The illustration is also suspicious, because Becky goes unmentioned in the narrative, but the identity of the object in Becky's hand is uncertain at best. Additionally, Jos does not die until "Three months afterwards [ . . . ] at Aix — La — Chapelle" (687). Chronologically, the relevance of the object in Becky's hand is rather diminished by this fact. If it is the murder weapon, why would Becky risk arousing suspicion by carrying it around three months before the murder? Why would she choose to do so during Dobbin's visit? It is established then, that both the narrative and the illustration do leave room for the reader to doubt Becky's guilt. The caption is in fact the "heavy — handed" element. The parallel which it draws between Becky and Clytemnestra cannot be attributed to the fallible created narrator because it is not part of the narrative. It is an anomalous piece of text, which sits below the image and restricts its potential for interpretation. The caption may be clumsy but it is necessary, due to the lack of evidence against Becky, in order to clarify Thackeray's intention. Gilmour, Robin. Thackeray: Vanity Fair. London: Edward Arnould, 1982. Steig, Michael. 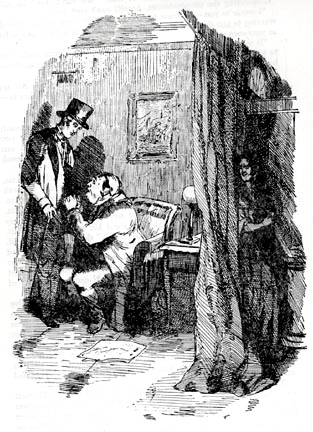 "Dickens and Browne: Illustration, Collaboration, and Iconography." The Victorian Web. Ed. George P. Landow. Viewed 8 February 2008. Thackary, William Makepeace. Vanity Fair. New York: Norton, First Edition, 1994.